Days have been crazy and Summer is in full swing! It's amazing how fast your schedule can fill up - this weekend turned out to be epic, like The Odyssey, so bear with me through this lengthy post. Chad and I had quite an amazing weekend last weekend. Since he's been working a ton lately, he was given the opportunity to take off a Monday (which I found out about 3pm, Friday), so I scurried to get the day off as well! Earlier in the week we came into a deal for some baseball tickets to Miller Stadium, so we bit and rounded out what we knew would be a fun-filled weekend! Chad did a wonderful job of planning this weekend of fun. He earns kudos, bonus points, and stars for organizing our mountain biking on Saturday, and Road bike adventure on Monday without any influence from me (other than I wanted to do something active). 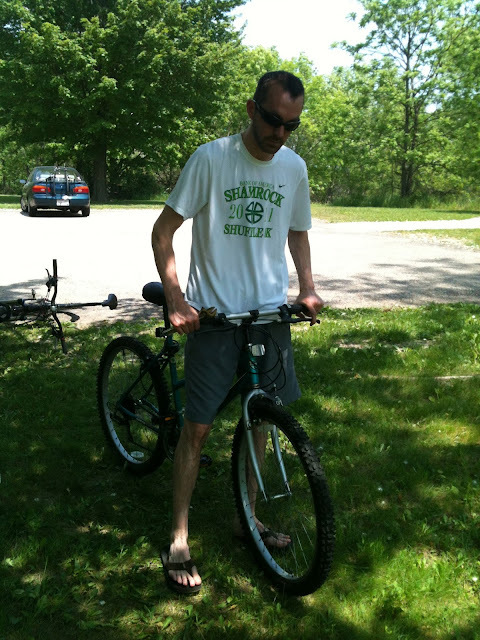 He also took charge and fixed up both my bikes, which I am so thankful that he does for me. I have no patience for bikes - and one and only reason I dislike biking is for how high-maintenance it is! Saturday got going around 9am and I cooked breakfast while Chad took on my POS bike. Let me backstep - I have 2 bikes. One I bought from Chad while he worked with a very well-known bike company (in order to take advantage of his amazing discount.) I purchased a hybrid: able to go over bumps and rougher but flat terrain, but also very good on the road. I love this bike, but am still a bit overprotective of it, and reluctant to ride this on inner-city travels where I have to lock it up and leave it in public. My other bike is my POS bike - you could say it stands for "piece of Shitake" bike. It is a bike I bought off a friend before I knew anything about cycling. It was cheap and functional for getting around town, but I'm really finding its limitations fast since I've been riding with someone who bikes on top-of-the-line equipment. Mountain biking proved to be amazingly beautiful and exciting, but a bit frustrating. My bike just couldn't handle the down-hill runs because it's not really functional for that type of terrain, so we stayed on the flatter trails. It was a bit limiting, but we got in a pretty good ride once all was said and done. Chad, hour 3 of working on the POS getting tires that could hold air, and breaks that could semi-help me stop. Chad stole this shot of me without my knowing until later when I was checking my phone. There were some pretty awesome trails out here in Cambridge, WI. Such a cute little community! The foliage was so awesome to enjoy and the weather has been more than amazing. Sunday brought another surreal day. 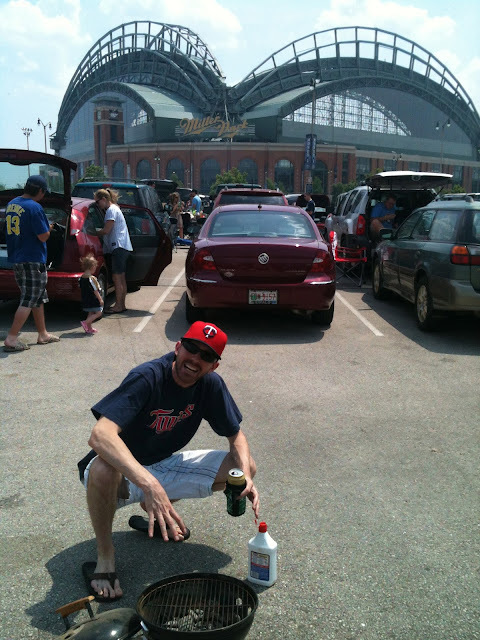 We road-tripped to Milwaukee and had a nice, basic Wisconsin Tailgate - just the two of us. Beer, brats, potato salad, chips and dip; that's about as easy you can make it! Want to tailgate like you're in Wisconsin? Don't forget the sour kraut nor the Spicy Mustard on your brats - and don't even think about touching it with katchup. That's sac-religious in these parts! We had the best time squatting on my old Buick's hood since we forgot chairs - but that makes it all the more memorable! 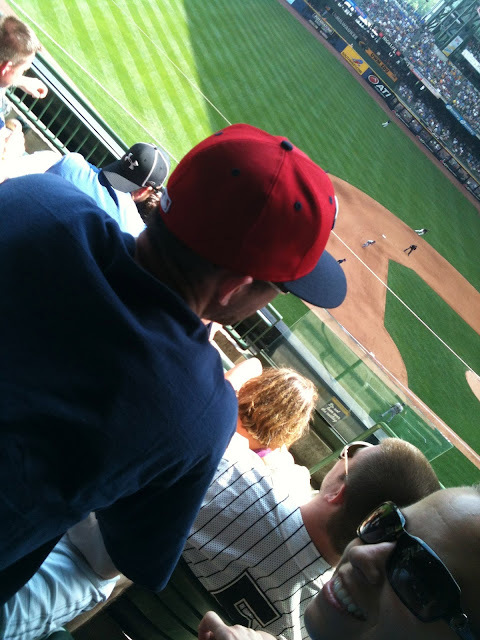 Not bad seats for this Twins vs Brewers game! Monday! Ah, Monday - such a gift not having to head into work! We awoke and got ready to head out almost immediately. Chad only had to fill up the air in my tires so we didn't have a lot holding us back this time - YAY! We took on the Madison trail system, which I'm not all that familiar with - yet. But, I was so amazed at how incredible they are! The scenery, foliage, and overall care taken to them; they were immaculate, and went on forever. We rode about 10 miles into downtown by Lake Mendota, and started to head around the lake. Chad said, "We should go around" and I knew this was going to be a day for the books! I'm one of those people who, if I like doing something I don't want to stop! So, being told that I can keep going and going doing something I'm really enjoying makes me feel like a kid who was told they were going to Chuck 'e Cheese! I couldn't believe the views we saw all around the lake; of the capital, the beautiful plants and the homes. If I ever get to purchase a house, I think the way I'll find it is on bike! Luckily I packed some money for what turned into a pretty lengthy ride because we got hungry about three quarters into our trek. Chad was hankering for Mexican food so we picked up some burritos. We stopped at a pier just off the path and ate on the water on a dock which proved to be one of the best views of the day. So bummed that I blinked, but check out this view on the water! Our ride tallied to about 30 miles once all was said and done; not bad for an impromptu ride on your day off! We made it around lake Mendota - check that off the bucket list! It's so great when you get to doing so much on a weekend where you don't really plan too much. What a good lesson to take life as it comes, and I like to think I bring a bit of good encouragement and realization for Chad to plan every once and a while. It's proof that we are a good balance, in that respect!